Creativity drives everything we do at Wilson. We enable brands to tell their stories using a broad spectrum of multimedia content—whatever connects and engages with their audience. If it means applying something new together, all the better. We could go on, but it’s probably best if you just check out some of our work. 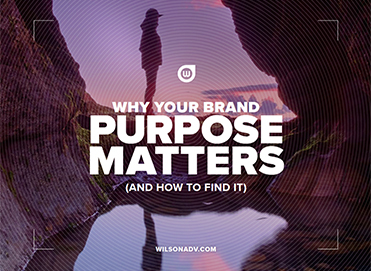 Discover why brand purpose is smart business. Our award-winning creative design team brings your brand to life with moving imagery and powerful aesthetics. No matter the marketing channel, we can develop a creative design that grabs attention, drives interest, and most of all – inspires action. It’s exciting times in marketing because there are countless ways to communicate with your audience. We’ll work with you to determine the best way to reach them and tell your story. Then we’ll execute with a creative flair, whether that requires Virtual Reality, videos, or some totally unique experience. Without a doubt, experiences create a memorable impact. We specialize in designing experiences with a focus on the user. Whether that means awe-inspiring huge scale interactive video projections or creating an augmented reality vending machine we always think experience first. The term “advertising” holds multitudes of meanings. Some hear the word and think “Madmen.” Other’s think “Super bowl.” It is those things and so much more, including creative design, campaign planning, development, and execution across a variety of media. And it can change the world! Brands without websites are like retail stores without a storefront. Websites are the de facto hub that communications flow through and they’re the first place customers, clients and anyone interested in your brand turn for information about you. That makes a great user experience and a design that accurately represents your brand paramount.